Classic Thai, Ayudhaya style teakwood beach house, set in a beautiful lawned coconut grove on a secluded bay. Amenities LCD TV/DVD, iPod dock, Wii, full air-con, fully equipped kitchen, WiFi internet, kayaks, trampoline, table tennis, private tennis court. Ban Sairee is located on a stunning isolated beach, and is surrounded by grass lawns and ancient coconut palms. On the island’s south coast, slightly west of the landmark ‘Golden Pagoda’, the property offers fabulous sea views, and overlooks the undeveloped islands of Koh Tan and Koh Matsom, which can both be reached by a short boat ride. Designed in classic Thai Ayudhaya architectural style, and furnished with ‘old world’ flair, Ban Sairee comprises a pair of grand teakwood villas, each consisting of two pavilions that are adjoined by vast wooden decks. Each of the two mirrored villas comprises a separate living and sleeping pavilions. The living pavilions feature spacious open-plan living rooms, with polished wooden flooring, vaulted wood-paneled ceilings with exposed beams, and wood paneled walls. Foldaway glass doors open out on to the deck to the front and rear, integrating indoor and outdoor living space, and allowing the balmy sea breezes to flow through. A fully equipped kitchen occupies one corner of the living room, which is furnished with a large teak dining table, and sumptuous water-hyacinth sofas that faces the sea views. Adjacent to the living rooms are adjoining TV rooms, with deep daybeds and LCD TV/DVD. A second dining set on the deck provides an enticing venue for al-fresco meals. Teakwood, cushioned sun-loungers complete the deck furnishing, leaving ample space for enjoying the fenced verandah, which is ideal for children to play on. The 2 identical sleeping pavilions each feature a double bedroom, twin bedroom that can be made as a king, and an optional bunk bedroom. All of the bedrooms have en-suite bathrooms, high ceilings and suspended fans, polished wood floors, wood-paneled walls, and sliding glass doors opening out on to the wooden decks, sea views, and breezes. The twin and double bedrooms have large, walk-in wardrobes, and marble-clad bathrooms with bath-tubs, and outdoor rain-showers. The children’s bedrooms are interconnected to the master bedrooms, and furnished with bunk beds, with an en-suite bathroom with shower. All four pavilions have direct access to the secluded beach that lies beyond the palm-shaded lawns. Between the villa and the beach, is the large swimming pool, with an overflowing infinity-edge that blends into the sea view. The pool is surrounded by a stone patio on 3 sides, with cushioned sun-loungers and parasols. A full-size fenced tennis court is located behind the villa, along with a trampoline, and the staff house, which has a kitchen for catering preparations. Two rice barns are furnished with twin beds that can be made up as kings. The big barn has an ensuite bathroom, a lounge, and direct access to the beach. The small barn is located to the rear of the main house, and has a bathroom upstairs, as well as an outdoor shower. A beachfront honeymoon suite features 4-poster bed, a lounge area, and a luxurious indoor/outdoor bathroom. 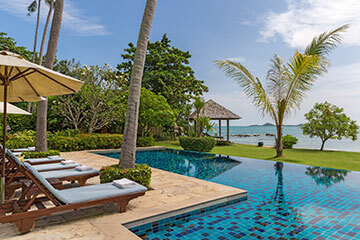 Ban Sairee is located on the south coast of Koh Samui, some 35 minutes from the airport, 15 minutes from the towns of Lamai and Nathon, and 25 minutes from Chaweng. The villa is set on a secluded shallow bay. *2 bunk bedrooms in the main house are available, each at a daily charge of $100++ USD, free during Xmas/NY, CNY, and Easter. **2 rollaway beds are available, each at a daily charge of $50++ USD, free for children under the age of 12.